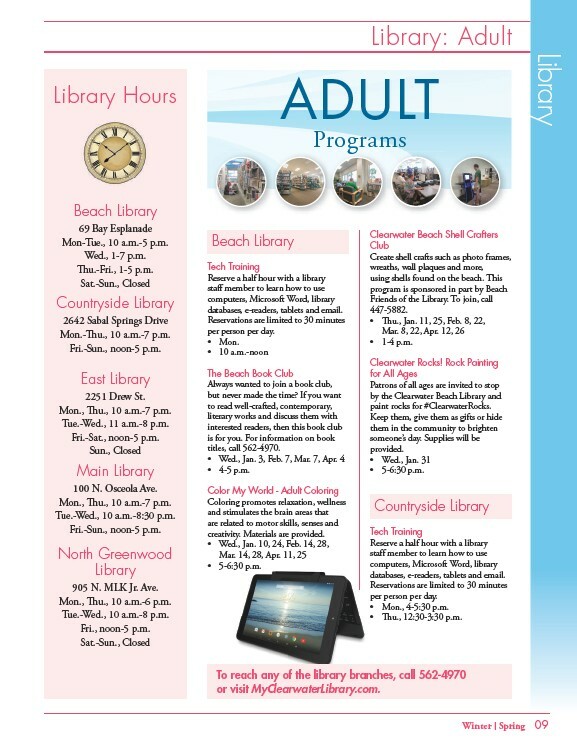 Library Library: Adult Winter l Spring 09 Library Hours ADULT Beach Library 69 Bay Esplanade Mon-Tue., 10 a.m.-5 p.m. Wed., 1-7 p.m. Thu.-Fri., 1-5 p.m. Sat.-Sun., Closed Countryside Library 2642 Sabal Springs Drive Mon.-Thu., 10 a.m.-7 p.m. Fri.-Sun., noon-5 p.m. East Library 2251 Drew St. Mon., Thu., 10 a.m.-7 p.m. Tue.-Wed., 11 a.m.-8 p.m. Fri.-Sat., noon-5 p.m. Sun., Closed Main Library 100 N. Osceola Ave. Mon., Thu., 10 a.m.-7 p.m. Tue.-Wed., 10 a.m.-8:30 p.m. Fri.-Sun., noon-5 p.m. North Greenwood Library 905 N. MLK Jr. Ave. Mon., Thu., 10 a.m.-6 p.m. Tue.-Wed., 10 a.m.-8 p.m. Fri., noon-5 p.m. Sat.-Sun., Closed Programs Beach Library Tech Training Reserve a half hour with a library staff member to learn how to use computers, Microsoft Word, library databases, e-readers, tablets and email. Reservations are limited to 30 minutes per person per day. • Mon. • 10 a.m.-noon The Beach Book Club Always wanted to join a book club, but never made the time? If you want to read well-crafted, contemporary, literary works and discuss them with interested readers, then this book club is for you. For information on book titles, call 562-4970. • Wed., Jan. 3, Feb. 7, Mar. 7, Apr. 4 • 4-5 p.m. Color My World - Adult Coloring Coloring promotes relaxation, wellness and stimulates the brain areas that are related to motor skills, senses and creativity. Materials are provided. • Wed., Jan. 10, 24, Feb. 14, 28, Mar. 14, 28, Apr. 11, 25 • 5-6:30 p.m. Clearwater Beach Shell Crafters Club Create shell crafts such as photo frames, wreaths, wall plaques and more, using shells found on the beach. This program is sponsored in part by Beach Friends of the Library. To join, call 447-5882. • Thu., Jan. 11, 25, Feb. 8, 22, Mar. 8, 22, Apr. 12, 26 • 1-4 p.m. Clearwater Rocks! Rock Painting for All Ages Patrons of all ages are invited to stop by the Clearwater Beach Library and paint rocks for #ClearwaterRocks. Keep them, give them as gifts or hide them in the community to brighten someone’s day. Supplies will be provided. • Wed., Jan. 31 • 5-6:30 p.m. Countryside Library Tech Training Reserve a half hour with a library staff member to learn how to use computers, Microsoft Word, library databases, e-readers, tablets and email. Reservations are limited to 30 minutes per person per day. • Mon., 4-5:30 p.m. • Thu., 12:30-3:30 p.m. To reach any of the library branches, call 562-4970 or visit MyClearwaterLibrary.com.